When I first met Ting Ting Liang at her bar in Shanghai, she came across as fast but attentive, caring but assertive. Walking in, she lights a cigarette without pausing, and the bartender mixes her a cocktail, unprompted. She apologizes for being a few minutes late, as she was busy working on her next project: RIINK, a roller skating-themed bar in the local arts hub West Bund. Liang owns and operates Roxie’s—the first and pre-eminent lesbian bar in Shanghai. She is one of four women I interviewed who stand at the center of Shanghai’s LGBTQ community. Each strives to strengthen visibility and support for the city’s queer community, in their own style and through their own means. Originally from Holland, Liang studied international relations and international business in university, during which she completed an exchange year in Shanghai. Her family owned a Chinese restaurant in Holland, which exposed her to the food and beverage industry. When she returned to Shanghai after graduation, she knew she wanted to work in Shanghai’s “limitless” nightlife scene. “The crazier the better,” she said. She got a job working as a bartender at a metal bar called Inferno and quickly worked her way up to managing it full-time for three years. Liang acknowledges this phenomenon is common in Shanghai—a planned city with little patience. Her next move was establishing Roxie’s, which opened on August 21, 2014. Given the economic risk of running lesbian bars, she knew she was taking a significant risk. Shanghai’s food and beverage industry has a fast turnover rate and there have been few successful bars specifically catering to the queer community, Liang said. But Liang, a queer woman, felt confident opening a lesbian bar. “I knew it was going to work because I was building a bar for me. I was building a bar I would want to go to,” she said. Bras hang from the ceiling at Roxie’s. The lesbian bar is a preeminent and dependable space for LGBTQ individuals in Shanghai, particularly queer women. Credit: Roxie’s. In addition to providing high quality service to all customers, Liang puts effort into creating a safe space for queer women. She thinks it’s vital for “the girls,” her regular customers, to have a place they can rely on where they feel always safe and welcome. “I want the girls to know we’re always here and they don’t have to question that,” she said. Regulars rely on Roxie’s for providing a space of acceptance and fun. As Liang pointed out, queer women should have a space to call their own. Liang wants Roxie’s to be a space that is both fun and empowering. “The goal is to change people’s state of mind: we don’t have to hide in a corner,” she said. Other organizers share Liang’s sentiments. Charlene Liu, co-founder of Shanghai Pride, which runs events celebrating the local LGBTQ community, became an accidental activist after moving to Shanghai in 2005. Born in Malaysia in the 1970’s, Liu grew up living with her mother and grandmother and attended an all-girls school. She studied engineering—a rare field for a woman from Malaysia at the time—and was a semi-conductor for twenty years. She is also co-founder of Ladies Who Tech, an organization focused on supporting women working in STEM fields. When work brought her to Shanghai in 2005, she immediately started making friends within the queer community, mostly through partaking in the city’s nightlife. “First of all, I like to party,” she said. In 2009, some of her queer friends were leaving the city, and they wanted to throw a giant goodbye party. 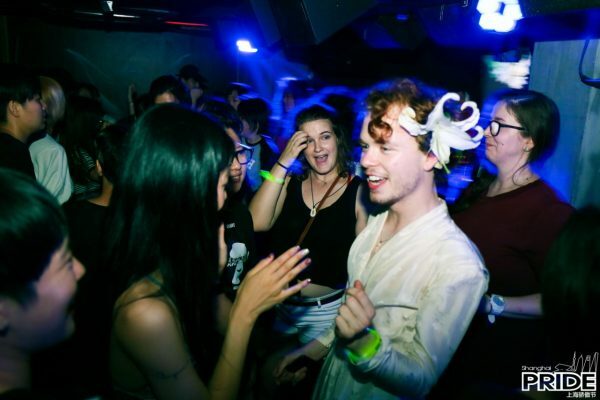 Party-planning snowballed into organizing a more large-scale, robust event that included panels, workshops, and musical performances anchored in discussions of queerness in Shanghai. The positive feedback from those who attended the event made Liu—as well as her fellow organizers and friends—realize there was a high demand for LGBTQ community-building events in the city. With that, the annual ShanghaiPRIDE was born in 2010. More than ten years later, ShanghaiPRIDE functions as a localized and well-established answer to Pride parades around the world. It includes panels, parties and other events hosted by LGBTQ rights organizations such as Women Up!, PFLAG, Queer Talks, and more. Liu also met her wife at ShanghaiPRIDE in 2013, and within a week they were living together. What role do foreigners play? Foreigners and Chinese locals celebrate Shanghai’s LGBTQ community through the city’s nightlife scene. Credit: ShanghaiPRIDE. When I spoke to Liu last spring, she and her colleagues were in the midst of preparing for the 2018 Shanghai Pride. She described this coalition of volunteers, including foreigners as well as local members of the queer community and their allies, as highly motivated and organized. Most of the women I interviewed brought up the idea of accessibility and inclusion through language. It seems to be a key priority that everyone in Shanghai should be able to participate in any event without having to learn a second language, be it Chinese or English. To make that happen, talented translators—and specifically translators who can bridge language as well as cultural barriers in order to translate LGBTQ-related issues—are in high demand. One of them is Lilian Shen, improv performer and trainer, and queer feminist activist. Shen was born in 1992 in the United Kingdom. She moved to Beijing when she was three years old, Singapore when she was five, Shanghai when she was twelve, and San Diego when she was 18. After attending college in the the United States, she came back to Shanghai and decided to devote herself to acting, improv, and community-organizing. She focuses on a wide range of women’s issues and contributes to a community of contemporary Chinese feminists. “Women experience a very different world than men, and we are forced to think differently as a result,” she said. 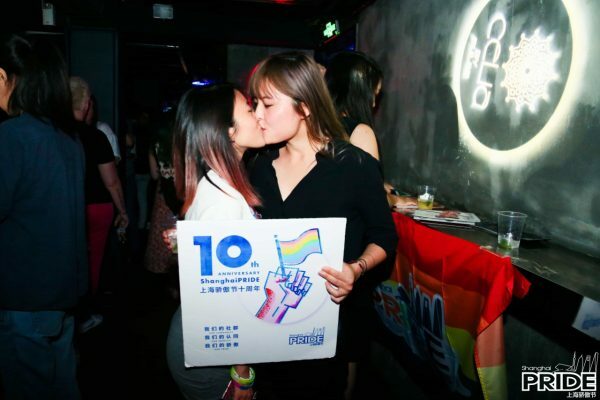 Partygoers at a ShanghaiPRIDE celebration on June 2018. Credit: ShanghaiPRIDE. Shen is the founder of Women Up, a lecture series dedicated to spreading necessary dialogue surrounding women’s rights in China. Women Up started as a resource for professional development, but has since expanded to include discussions of all women’s issues. For example, after China passed its anti-domestic violence law in 2016, a rare opportunity emerged for Shen to organize a discussion on domestic violence in China and the complications of the new law. Shen believes discussions about various modes of oppression should be accessible to all members of the oppressed group. Language is an essential ingredient for inclusive dialogue, she said. Shen also runs Queer Talks, a discussion group that brings together foreign and Chinese members of the queer community to talk about issues ranging from coming out to queer representation in the media. Shen translates in real-time for the audience. As Shen and I discussed, we are in China, not Chinatown. China’s national language doesn’t change because there are foreigners present who cannot speak it. “I understand why it’s important to have bilingual events, but if I had to pick one language it would be Chinese,” she said. The Chinese queer community is also not simply waiting for acceptance to parachute down from the West. Locals—not transient foreigners who live in Shanghai for a couple of years before returning home—need to lead the charge for creating lasting change. Foreigners who live in China permanently might also play a bigger role in supporting LGBTQ community-building in Chinese cities. However, at times it makes sense to place the least vulnerable at the forefront. For example, Liu explained that most of ShanghaiPRIDE’s public speakers are foreigners. A platform as visible as Pride poses a much more significant threat to a Chinese citizen than a foreigner. In the long-run, organizers hope that everyone—regardless of their nationality—can play an active role in China’s pro-LGBTQ movement safely and without fear. A couple shares a kiss at ShanghaiPRIDE. A lot has changed since many of these organizers first came to Shanghai. For Liu, one of the most significant transformations include the expansion of the community’s visibility, from gatherings located within just a few bars to events around various parts of the city. More grassroots organizations have also emerged, catering to a wider range of interests within the community. Additionally, more businesses have expressed interest in sponsoring ShanghaiPRIDE, and more organizations are participating in the event as partners. More people are also willing to have their photos taken and published at ShanghaiPRIDE, she noted. Yet the community continues to face challenges, Shen said. Major obstacles include threats from local authorities who seek to homogenize the population and retain the heterosexual status quo. In China, the concept of (和谐) or harmony is paramount. Johanna M. Costigan graduated from Bard College, where she was a double major in Written Arts and Asian Studies. A native New Yorker, she first practiced her Chinese while ordering dumplings in Chinatown. She writes fiction, nonficiton, and poetry. 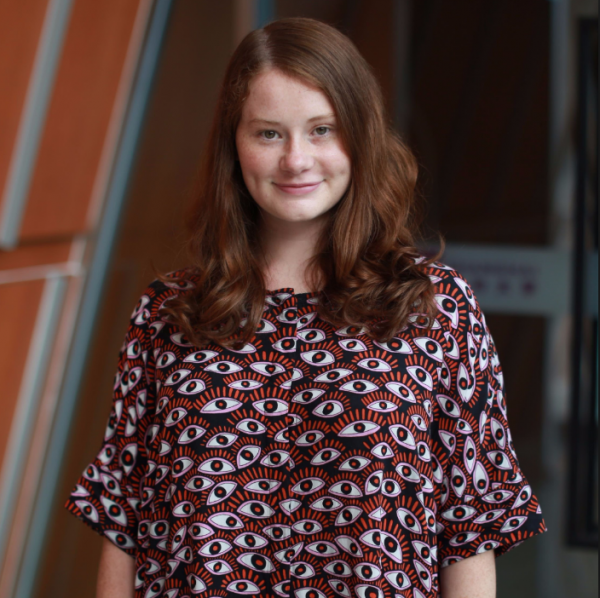 During her Writing and Speaking Fellowship at NYU Shanghai, she has completed a year-long poetry translation project as well as a research paper on WWII museum narratives in China.